You must purchase this integration separately from both your BeyondTrust software and your Zendesk solution. For more information, contact BeyondTrust sales. 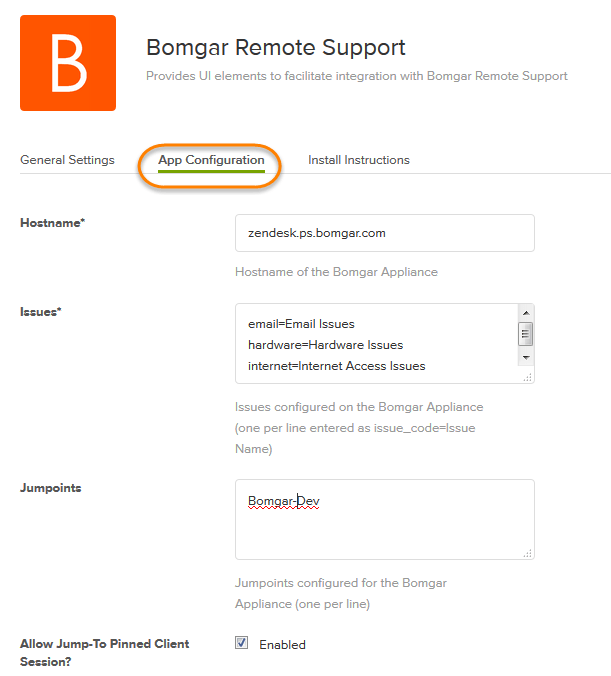 Log into the Zendesk Agent Interface as a user with Administrator access. 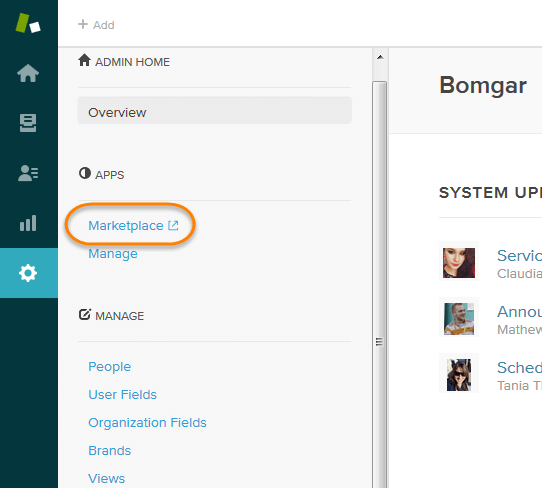 Click the Admin (gear) icon in the left navigation area to open the Admin Home menu. 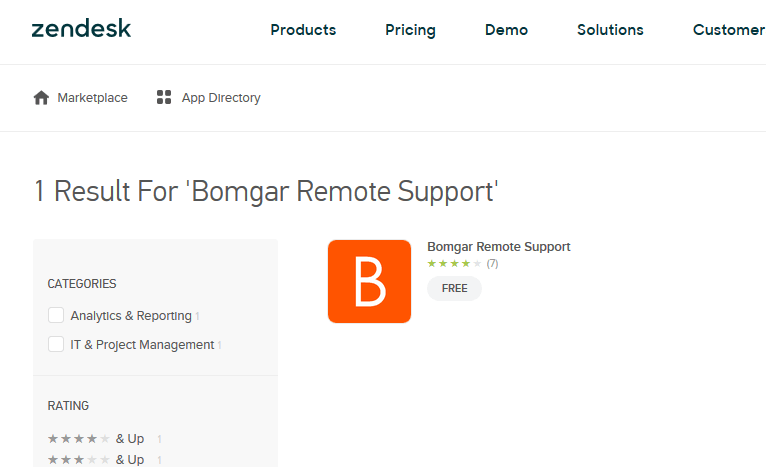 Search the Marketplace for BeyondTrust Remote Support. Select and install the app. Hostname (required) - The hostname of the Secure Remote Access Appliance. Issues (required) - A list of issues from which an end-user can choose when using the Get Support Now button to start a chat session. These should be entered one per line with the format issue_code=IssueName, where issue_code is the code name configured for the issue in the BeyondTrust /login interface and IssueName is the user-friendly name displayed to the end-user in the dropdown. For example, if there is an issue in BeyondTrust named General Technical Issues with a code name of general_tech, the corresponding entry in the issues list in Zendesk should be general_tech=General Technical Issues. Jumpoints - A list of Jumpoints configured for the Secure Remote Access Appliance from which an agent can choose. These should be entered one per line. Allow Jump-To Pinned Client Session - Determines if agents can Jump to Jump Clients. Allow Push and Start Local Jump Session - Determines if agents can Jump to systems on their local network. 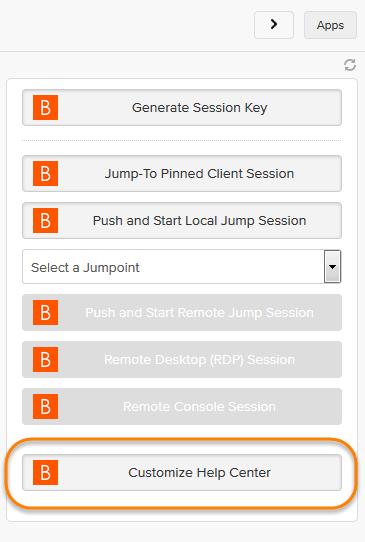 Allow Push and Start Remote Jump Session - Determines if agents can Jump to systems through a Jumpoint. If enabled, requires at least one Jumpoint to be entered. Allow Remote Desktop (RDP) Session - Determines if agents can start Remote Desktop Protocol sessions through BeyondTrust. If enabled, requires at least one Jumpoint to be entered. Allow Remote Console Session - Determines if agents can start Shell Jump sessions through BeyondTrust. If enabled, requires at least one Jumpoint to be entered. Once the app is installed and configured, you can see the UI elements in the appropriate section when viewing an existing ticket. The integration functionality is not available until the ticket has been saved. Therefore, buttons are not present on a new, unsaved ticket, though the app does render a brief message to that effect. When viewing a ticket as an administrator, click the Customize Help Center button. 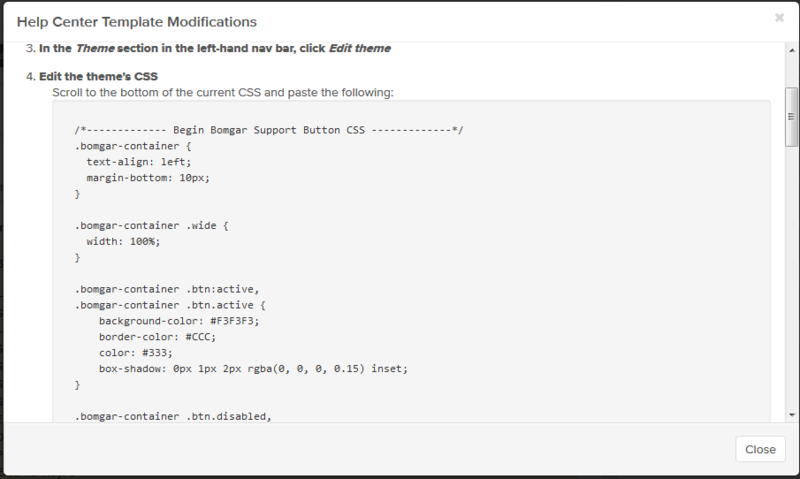 This opens a modal with instructions for editing the current theme to add the Support button to ticket views for end-users. 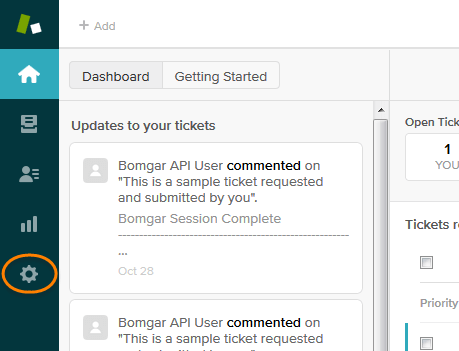 When clicked, a chat session starts and is automatically tied back to the ticket. The session is routed to the appropriate team based on the issue selected by the user prior to clicking the button. For information on configuring teams, issues, and session routing with BeyondTrust, please see Support Teams, Issues, and Equilibrium for Automatic Session Routing. Under Manage > People, click Add Role. If your Zendesk plan does not support the creation of new roles, skip to step 4 and add the user to the Administrator role. 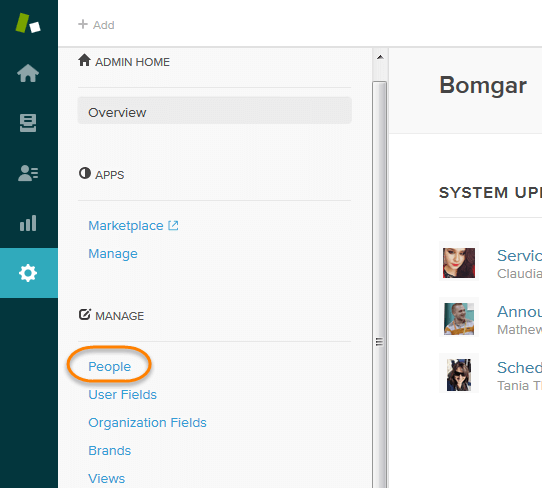 Under Manage > People click Add User. Create a new user named BeyondTrust API User (or whatever name you prefer) with the API Only role. Verify the new API account via email.